64 pages. A must-have for any owner of a classic Williams electro-mechanical pinball game, shuffle bowler, baseball game, or other coin-op arcade game! 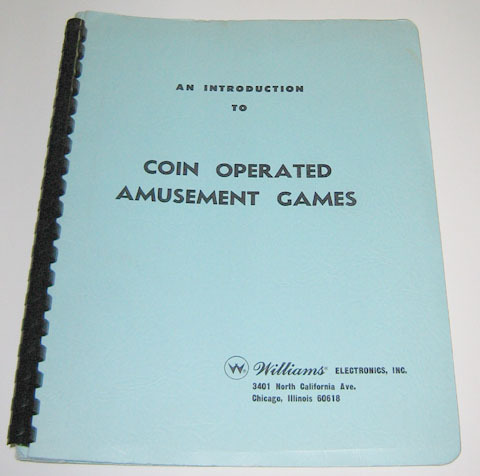 This manual is considered the "bible" for Williams electro-mechanical (EM) games from the 1960s through 1977. Features an in-depth "theory of operation" guide and comprehensive operation/repair manual with photo diagrams, schematics, and descriptions of the mechanisms and devices used in these games- how they work, what they do, and how to maintain and service them. An absolute must if you are just getting started with Williams electro-mechanical games. Reprint manual in new condition.